New Year‘s is a time to reflect on things we want (or need) to change, from getting fit or quitting smoking to getting a better job or spending more time with family. It’s a time to replace bad habits with good ones and to follow through on them. How many of us, however, have made our resolutions with the best of intentions, only to break them weeks or months later? Perhaps more urgent matters crop up that consume our energies, leaving us too exhausted for anything else. Or perhaps we get discouraged with our progress and lose our desire and resolve to carry on. Whenever I face just such a dilemma, I look to Covey’s third habit, “Put First Things First,” for perspective and guidance. While Habit 2 is about self-leadership, Habit 3 is about self-management. Leadership defines the “first things,” and management is the discipline to carry them out in accordance with our core principles. “Putting first things first” means we have the will to do something when we don’t want to; to say “no” to some things (even seemingly urgent things); and to act on our values, rather than on impulse. Simply, it means focusing our time on what’s truly important. 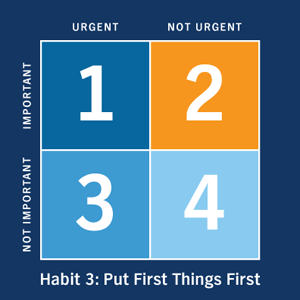 Habit 3 tells us to spend most of our time in Quadrant 2, to minimize our time spent in Quadrant 1 and to stay out of Quadrants 3 and 4 altogether. In doing so, we pursue our highest priorities—the relationships and results that matter. Our crises would then become more manageable because we’re proactively doing the things that prevent them from happening in the first place. For me, “putting first things first” is not only a habit of effectiveness, but also an act of integrity to our commitments and purpose. By honoring both, we position ourselves to seize the right opportunities at the right time—ones that can enrich our lives and livelihoods in the New Year and beyond.